There are a couple reasons to follow Kim Kardashian West on Instagram, the foremost being for adorable photos of her three kids: North, Saint, and Chicago. North is the precocious leader of the crew, Saint is the doe-eyed mini Kanye, and Chicago is the new kid, along for the fun ride. In between ads for KKW Body and other glam BTS selfies, Kim will bless us with some snaps of the kiddos. On May 23rd, Kim shared a recent throwback photo of North from Mother’s Day at Kourtney Kardashian’s house, and in it, North is doing that iconic “two kids standing on each other’s shoulders in a trench coat” gag. You might recognize this from the Muppets, who did it all the time. Some people know it as the “totem pole trench.” Our favorite instance was in the 2011 live-action film The Muppets. Our other fave “trench coat” scene is in the 1994 film The Little Rascals, also known as the “Thank you, my good man,” scene. North is just out here being a comedy legend. Standby for her forthcoming sketch-comedy YouTube channel. This isn’t the only delightful family photo Kim has shared lately. Yesterday she posted this photo of Saint and Chicago, and we’re typing this from beyond the grave because we’re nearly dead from gazing upon so much cuteness. It’s also an unexpected surprise to see a Kardashian-Jenner baby without a Snapchat filter. 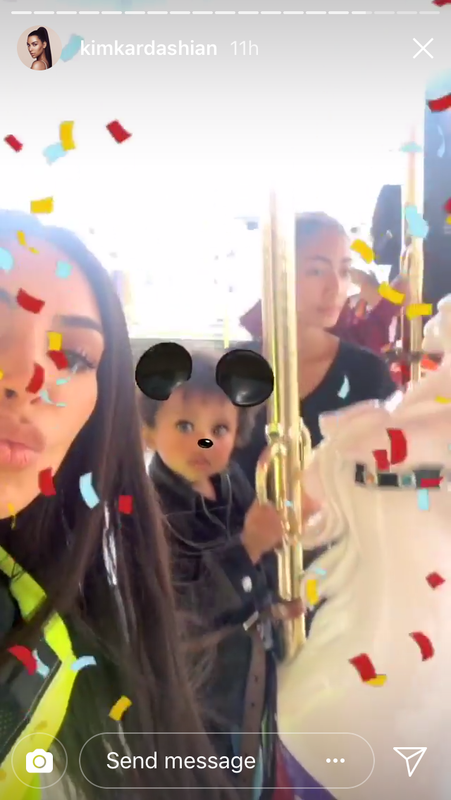 Oh, but if you like the Snap filters, Kim and her kids recently visited Disneyland, where she shared this photo of Saint on the carousel. 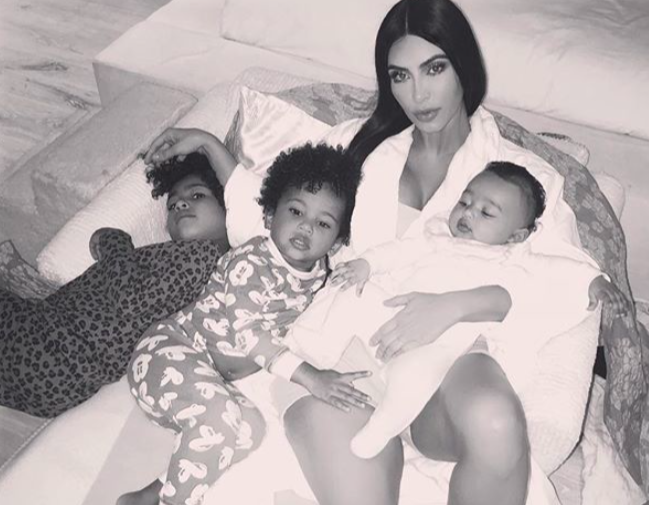 On Mother’s Day, Kim revealed that she had to bribe her kids with lollipops to get them to take a decent group photo, but it honestly seems like the Kardashian-West household is just a round-the-clock source of adorable #content. All hail a photogenic baby-making legend.